The Office of High Ability Education administers grants that support school corporations in the development of local programs and services for high ability students and provides resources, workshops, and materials suited to the needs of the high ability population. 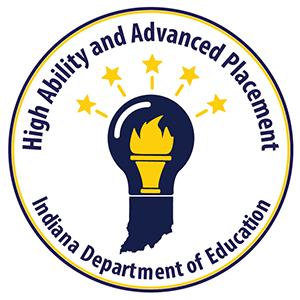 Effective July 1, 2007, Indiana schools shall identify students with high ability in the general intellectual and specific academic domains and provide them with appropriately differentiated curriculum and instruction in core content areas, K-12 (refer to IC- 20-36-2-2). Is characterized by exceptional gifts, talents, motivation, or interests (IC 20-36-1-3). We look forward to you joining the High Ability Collaborative Community. Please stay connected and informed by signing up for the newsletter.